Without the use of the either the shock cut or clever juxtaposition this documentary from Akira Ide, a Japanese and Italian co-production, seemingly owes less to Mondo cane and it's ilk and far more to early twentieth century ethnographic and travelogue along the lines of Africa Speaks or Beyond Bengal. Scenes of ritual slaughter of pigs are unpleasant but are filmed in the flat style of travelogue rather than the zooms of the cannibal genre. The extended voyeurism and burial rites segments are morbid yet at the same time fascinating. Often repellent and sometimes possibly staged the documentary is nevertheless fascinating and if cut free of the sniffy voice-over, complete with white man's burden conclusion, provides an incredible insight into a lifestyle that has been, through the colonial age, both the subject of revulsion and almost obsessive fascination. 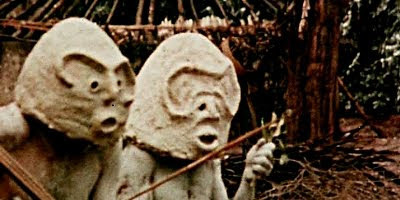 Homosexuality and feminism in tribal life are both touched upon briefly but the documentary quickly returns to its favoured themes of blood, conflict and death with leprosy and ritual beatings being seen as far more interesting than the rights of women to have more than one husband and being valued more highly than five pigs and the brief scene of men in pink shirts holding hands. The commentary is consistently patronising and raises a metaphorical eyebrow at tribal customs, costume, conflict and rites that are unfairly compared to western norms without making any effort to present any serious anthropological analysis. Instead it attempts something else, it attempts to shock, and it succeeds. Footage from Guinea Ama is re-used in Bruno Mattei's Virus and the score features Riz Ortolani's Why which giallo fans will immediately recognise from So Sweet.. So Perverse.